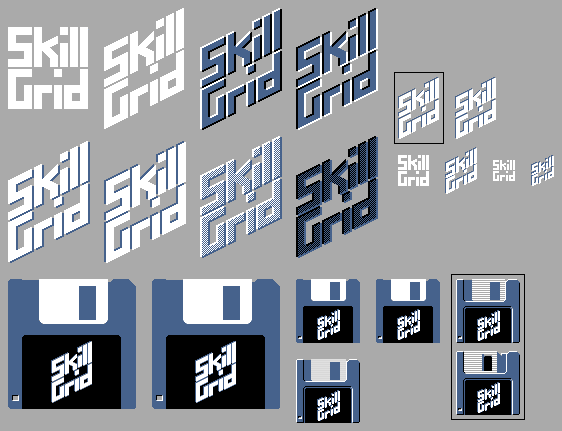 SkillGrid-new AGA game in the works by saimo !!! There is enough RAM left to add bossfights, more UFO types, and dynamic generation of the scrolling middle layer (and possibly improving the quality of some sound samples). The biggest issue will be stuffing everything into the 2 floppies (at the moment there are less than 110 kB free). By the way, of all the icons shown in the picture, only the ones surrounded by squares, which are in the old 4-color format, will be used, precisely to use as little floppy disk space as possible. Re: SkillGrid-new AGA game in the works by saimo !!! Thanks for opening the thread (and telling me that these forums are open again)! I've started working on the game in November 2017, and I've released a few progress reports in the meanwhile. Here are a few video previews that show how the game evolved over time (check out the descriptions in the videos for more information). A quick recap is also available on the game's page in my itch.io space. The dynamic tile-based generation of the middle layer is done. Besides looking cool, it saved about 30 kB of floppy disk space at little CPU cost. The picture shows various experiments and the final choice (the blue-purple gases/clouds). Currently I'm leaning towards the saturated red clouds, as that's less confusing to the eye and produces a smoother effect. Sorry, the game is for AGA Amigas only. can this played in IOS? * there are 47 kB of floppy disk space and 140 kB of RAM left: they will be used to make improvements and/or to add new features. Boss fights & more polished..LOVE IT!